Matthew Fisher has skipped the light fandango, leaving Procol Harum to embark on his own career which will include a solo album to be released by A&M Records toward the end of the summer. Splitting because of "personal reasons," he is now in the process of looking for a new band. In the meantime, Procol Harum have just released their fourth album titled Home, also on A&M, and are in the process of touring the States. Replacing the droopy-eyed organist, who announced a short time ago that he would quit performing with the group to concentrate on producing, is Chris Copping who will play organ and bass at the same time. Fisher, however, did not produce this album; it was produced by Chris Thomas, a well-known English producer. A spokesman for the group said Procol Harum were "very much more together" thereby indicating that there was much friction before Fisher left. It is still uncertain, though, whether Keith Reid, the group's heretofore stage-shy lyricist, would begin to play what was described as a "backing organ" in place of Fisher. He was supposed to do so before Fisher left [sic], leaving Copping, who was originally a one-for-one replacement for David Knights, to play just bass. Now, however, the famous interplay between Fisher's organ and Gary Brooker's piano, which set Procol Harum apart from most groups, is in jeopardy. The spokesman emphasized, however, that they would "maintain the sound." A person close to the group described Home as being a "monster." He said it was a "progression from A Salty Dog, better than it, but in the same vein." Making things all the more confusing during this hectic period was the fact that they were indirectly involved in a lawsuit involving Chrysalis Artistes Ltd, their English management and the Dee Anthony Management Corporation. The suit involves which outfit represents the group in America. There was some talk about the group not getting into the country, as another Chrysalis group, Blodwyn Pig, were held up about a month ago. This, however, was straightened out and a spokesman for Chrysalis said "there is no way in the world they won't get into America." The tour was scheduled to being on June 12 at Fillmore East and continue until the end of July. One of the stops they'll be making will be at the Ravinia Festival in Chicago, on July 17. The Ravinia represents contemporary music on Wednesdays and Fridays and classical music the rest of the week. When asked whether the theater was a prestigious hall for a rock group to play in, a spokesman replied, "most definitely." As for the shift within the group, it now seems that Gary Brooker is the key member. "Without him, Procol Harum would not be," said a person close to the band. Also taking on major importance is Copping who is filling two rather gifted pairs of shoes in Fisher and Knights. 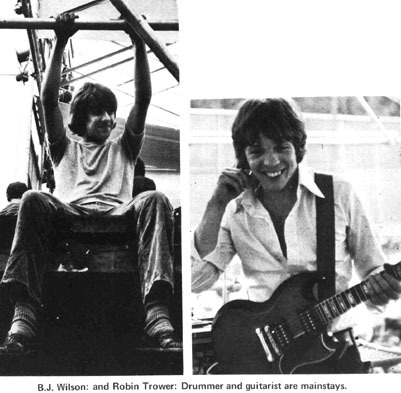 The drummer, BJ Wilson and guitarist Robin Trower remain fixed. About six months ago, on their last tour to the States, Brooker said the group was looking for a "more spontaneous sound." Also in the works at that time was a live album which will either be scrapped or released this winter, a decision seemingly based on the outcome of this tour and album. The group's management said they hoped and anticipated this tour to be the one which will put the group across to the American audience. Stating they "spend considerably more time in the States," they saw this album as being a big one. A Salty Dog, they said, had done moderately well in America, but was not as well received as they had expected. That album had given the group the direction it is now following after Shine On Brightly which marked the switch from Deram who put out their first album, to A&M. A sensitive thread had always tied Fisher, Brooker and Reid together through different guitarists, drummers, managers, record companies and a distinctly weird, almost magical career. Three summers ago, one of those smash singles made its way to the top of both WWRL and WMCA (et. al.) meaning it was solid in the hearts of the people (all people, with no classification). Not many groups, or artists, have managed such a doubleheader ... the Righteous Brothers, the Rascals and even the Stones. To hit big in both the soul/Motown and psychedelic/hip markets with a single release was no mean feat. Ergo, A Whiter Shade of Pale ... but who was Procol Harum. At first there was speculation that there was no Procol Harum, that some very strange poet had come to a publisher with the song, wanted it recorded and hired some studio musicians. At the time, it was true, there was no group; the song came long before the band. The truth was that it took Keith Reid a year and a half before he got it in on tape. And when he did, it was an instant worldwide hit although virtually no one had any idea of what the lyrics meant. There was even a Spanish version, Con Su Blanca Palidez. 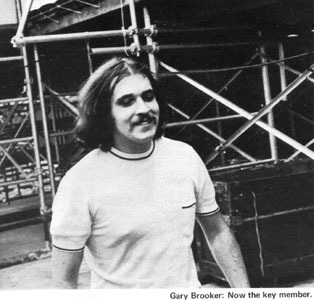 Things actually got started when Keith was introduced to Gary Brooker by a mutual friend who said, "This is Keith, he writes words," and then "this is Gary, he doesn't write words." Then they picked up the now departed Fisher who at the time was a classical organ student at the Royal Guildhall School. There the nucleus was formed, and they rounded up Ray Royer to play guitar and Bobby Harrison to play drums (both of whom were gone by the time the first album was to be recorded), and went into the studio with producer Denny Cordell to record A Whiter Shade of Pale. Their name, which translated very loosely from the Latin could be taken to mean "do your own thing," was taken from a cat – a Burmese blue cat which belonged to a friend of Keith's. Brooker still claims the cat has "magical properties, is uncanny, and no one has ever been able to take its picture." Procol Harum, the group's first album, was hailed universally as being highly inventive and original even though most of the songs sounded similar to A Whiter Shade of Pale. The second record, Shine On Brightly, was released more than a year after the first. In the time between, they had a chance to tour and listen to what other groups were doing, and responded with a heavier, more convincing statement of their own identity. The first song was Quite Rightly So, and it immediately suggested something a bit different in the wind. It began with an organ theme in a slightly varying rhythm which faded into a statement of the song's theme, still by organ alone, and then the sudden appearance of the rest of the group at the end of the passage. Here was a subtle difference already, for the songs on the first album were more simple. They began at a definite harmonic point and worked to a slight climax at the end. The approach on the second album was more theatrical. A Salty Dog demonstrated a new-found adroitness at songwriting. The title tune was backed by a full orchestra, for which Fisher [sic] wrote and arranged the music. It was different from what they'd done before, but completely honest, completely Procol Harum. Now Procol Harum are at a turning point, no matter what their manager says. 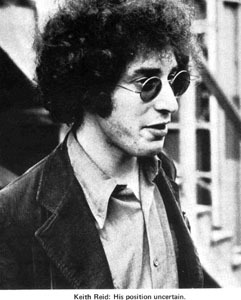 Matthew Fisher has signed on to the Albert Grossman office to publish his songs and will go his own way, leaving for the Coast to meet up with sixteen vestal virgins, perhaps. Procol Harum are in a different situation. They must hold things together, come out of their split with no permanent scars and move ever onward.